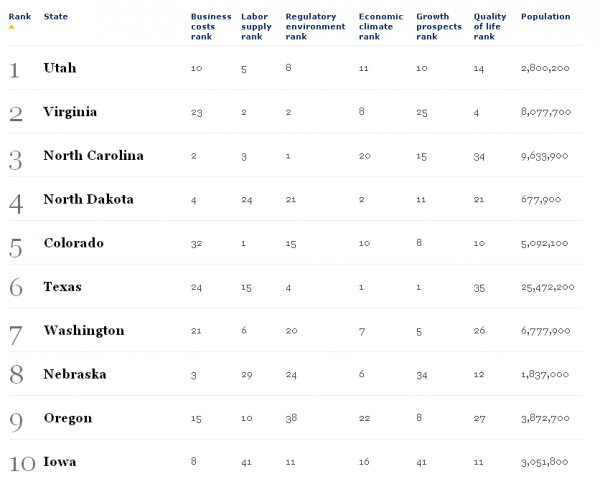 Forbes' list of top states for business was dominated by western states. Forbes magazine has ranked Maine as the worst state for business for a second year in a row. “Maine suffers from energy costs 31 percent above the national average, stagnant population growth and anemic forecasts when it comes to job and gross state product growth,” according to the magazine. The magazine has put out the list annually for six years. Maine has ranked near the bottom each time, but in 2010 dropped from 41 on the list to last. For in-depth coverage, see Forbes.com.